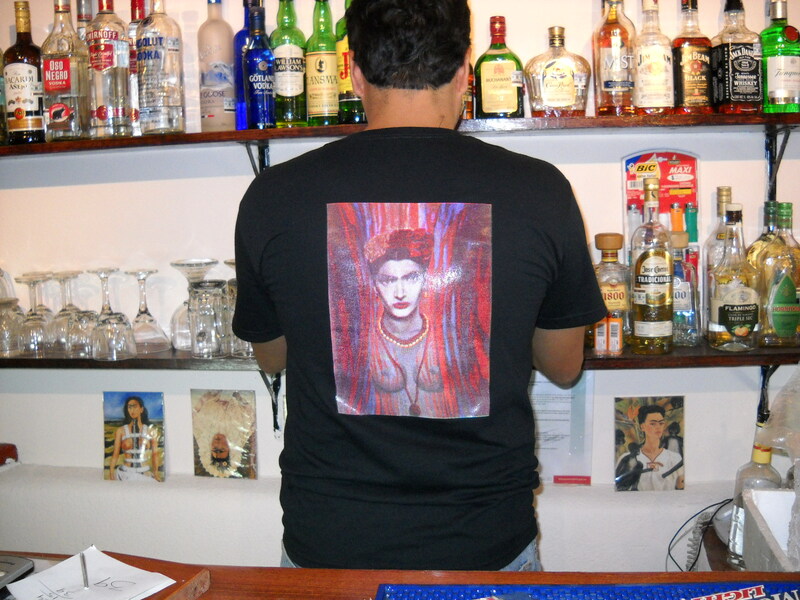 Frida’s new t-shirts now on sale! 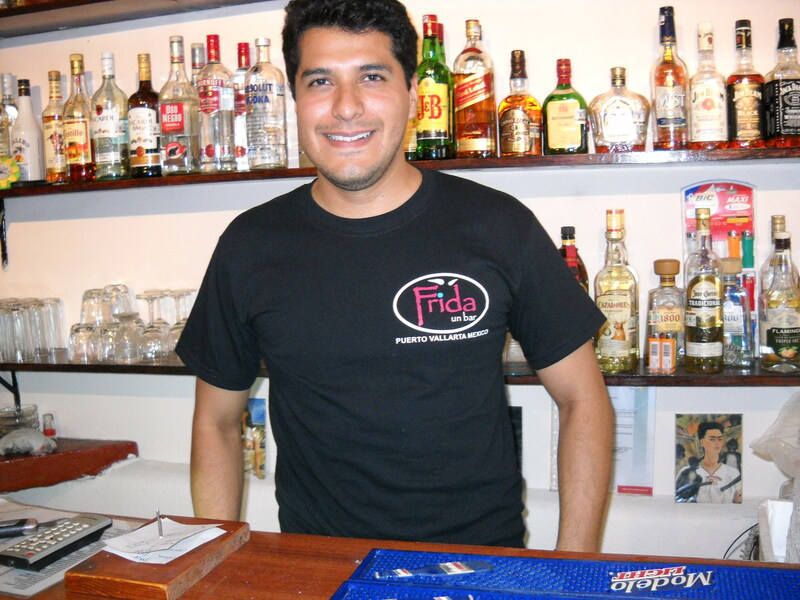 If you’ve been been to Fridas Bar and Restaurant in Puerto Vallarta you’ve most likely noticed the giant mural that once was the back wall of the original location. It’s been cut down and hauled to the new location a block away. It hangs along the long wall on the first floor, opposite the bar. When it was originally painted in 2002 by artist Jorge Zavala, it took 3 or 4 attempts and many months of work to get it right. Now nearly 8 years later, Jorge showed up a few days after the new bar opened and delivered a second piece of art to owners Tom and Luis. Like the first work, it was totally by surprise. Tom had not asked Jorge to paint a portrait of Frida, just like he had not asked Jorge to paint the mural on the wall in 2002, but agreed to let him after he asked. It was a good decision. The mural has been a conversation piece and admired over the years by thousands of tourists and locals. It captures the spirit of Frida beautifully and is full of symbolic imagery. The new work is grabbing lots of attention too and shows how the artist’s work has matured, I think. Many have threatened to steal it as they leave through the exit, where the new portrait hangs just to the right. So many liked it that Tom decided he’d use it for the new tshirts. Now you can take home a piece of Frida as a souvenir. The new shirts are only 150 pesos. Get yours today while they last. Here model and bartender David shows off the new shirt, front and rear. Enjoy. This entry was posted on November 28, 2009 by PVMINGO. It was filed under bar information . After having David’s amazing Bloody Caesar’s, he can definitely model anything! I’ve always admired that painting! How cool to be able to have it on a Frida shirt now!